"For the next 300 years, they ravaged the civilized nations. Nothing could stop them: not the oceans, not the dread of the unknown, not the rulers of Europe." While modern man likes to think that most progress is made through civilization, the fact remains that frequently over the centuries change and development have come about through upheaval caused by the thoroughly uncivilized. Indeed, much of European nation-building can be laid at the feet of the ravaging Vikings and Mongols. This four-part television series takes a look at four bands of barbarians and how they changed the world. The first episode covers the Vikings and their raids upon England and continental Europe, as well as their explorations to the west in Iceland, Greenland, and Newfoundland. Unlike the other three programs, this episode does have some emphasis on the archaeological evidence in the form of a burial ship. With the use of maps and animation, the spread of the fury of the Norsemen is given good immediacy. The Goths are taken up next, and their tale intersects with that of the Huns, who drove them out of their peaceable life in the eastern steppes and into the Eastern Roman Empire as refugees. The program presents the Goths as primarily victims of the Huns and then the Romans, who exploited them mercilessly until they could take no more and fought back with savagery that the Romans neither expected nor could defend against. When one thinks of the Mongols, one immediately conjures to mind the conquests of Genghis Khan, or Temujin, to give his proper name. The first half of the episode delves into his history and the empire he created. Surprisingly, his famous grandson Kublai Khan is pretty much disregarded in favor of Tamerlane and the rise of Samarkand in the second half. While there are some interesting looks at Mongol tactics, the episode suffers from some irritating mid-episode recaps. The concluding segment is devoted to the Huns, and in particular the person of Attila. Unlike the stereotype, Attila was an astute diplomat who worked for entangling marriages of diplomacy in efforts to bloodlessly solidify his rule. But unlike Genghis Khan, who planned for his succession, Attila's rule was personal and the Hunnic empire immediately falls apart on his death. But it did have the effect of consolidating power in the Catholic Church, which would have repercussions for centuries to come. The series is notable for relying almost entirely on recreations, with excellent production values. Frankly, however, I could have done with more historiography, telling us how we know what little there is to know about these unlettered tribes. 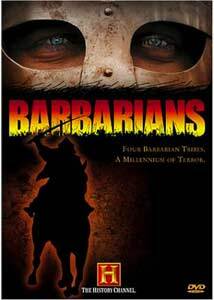 There is no dialogue, but Clancy Brown provides narration throughout, interspersed with talking-head footage of various historians discussing the barbarians at issue. Director Robert Gardner uses an active camera to keep the history lively, and the series makes for a very good introduction to these notorious figures of the Dark Ages and the medieval era. Image Transfer Review: The series is oddly presented in nonanamorphic widescreen. The result is a ton of aliasing and visible line structure throughout as well as notable artifacting. Edge enhancement is heavy, in a vain effort to introduce some detail into the picture. On the other hand, color is very good although black levels are a bit weak. Had a proper anamorphic transfer been made, this could have looked much, much better. Audio Transfer Review: The 2.0 surround audio track, on the other hand, has very little to complain about. The voiceovers and interviews are all crisp and clean. The music score fills the surrounds with good depth and presence and a fair amount of directionality. Bass is surprisingly good for a television presentation. Extras Review: The two-disc set features a very useful extra: The Biography episode devoted to Genghis Khan. Although it covers much of the same ground as the first half of the Mongols episode, it uses very different techniques that make for an interesting comparison of the effect of presentation on the message. With the more ample running time, obviously, more detail can be presented, but there are also quite a few excerpts from The Secret History of the Mongols, a contemporary account that tells much of what's known about Genghis Khan. Though not as lively in presentation as the main feature, it's certainly a worthwhile extra for the history buff. Less essential is a 20m:47s promo piece entitled Barbarians: Behind the Shield. It's pretty dispensable, since, other than a few interview segments with Gardner, it's mostly comprised of a collection of clips from the miniseries. While the presentation is excellent for those new to the histories of these peoples, history buffs will find themselves looking for more substance. But stylistically, they're very well done, though the transfers are poor.